The name Yen Liang is legendary around the Diablo Symphony Orchestra. He played second violin in the Orchestra for many years after moving to Rossmoor upon his retirement in 1973. Yen and his wife, Dolly, were ardent supporters of music education. The Diablo Symphony named the annual youth artist competition after Yen in memory of his many fine contributions to the Orchestra and to the community. He continued to pursue the violin as well as his other interests, making pottery, designing furniture, golfing and writing children’s books (of which he wrote five) almost up until the time he passed away. Yen Liang was born in 1908 in Tokyo, where his parents were studying law and art. In 1910, he moved with his family to China where he studied violin early on. After graduating from Tsing Hua College in Beijing, Yen Liang decided to travel to the United States in 1928 to pursue architecture. Yen attended Cornell, M.I.T. and Yale, where he finished his undergraduate degree in three years. He enrolled in the Harvard graduate school, but felt no closer to understanding architecture until he read Frank Lloyd Wright:An Autobiography. He immediately applied to Wright’s Famous Taliesin Fellowship and, at 23, Yen Liang became Frank Lloyd Wright’s first apprentice. Yen and Edgar Tafel, also one of Wright’s earliest apprentices, became close friends, and they often played violin sonatas for Wright and his guests. Wright was not only Yen’s mentor, but also a close friend. Yen returned to China in 1934 where he worked as a prominent architect designing the International Club in Nanking, the Yunnan Trust Building, the Bank of Yunnan Mining Industries, as well as a residence for Generalissimo and Madame Chiang Kai-shek. During his last years in China, Yen Liang worked in Kunming for the U.S. Army. After the war, Yen and Dolly returned to Taliesin for six months at the invitation of Frank Lloyd Wright, then moved in the mid 1940s to New York City. There Yen worked for the United Nations Planning Office until 1950. From 1950-1973, Yen was the chief designer with Harrison and Abramovitz for the United Nations Headquarters in Manhattan, the Battery Park projects, and the Albany Mall. Yen’s retirement did not slow him down. Taking up golf at Rossmoor allowed him to recover from a life-threatening illness and enjoy another 27 years as patriarch among Chinese-American families in Rossmoor, an art director of the Rotary Club, and above all, as a staunch supporter of the Diablo Symphony. His gentle manner, his wit and humor, his musicianship and his devotion to the Orchestra endeared him to all. 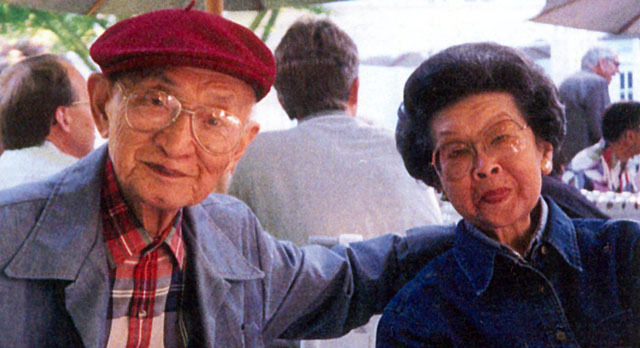 An amazingly multi-talented and beloved man, Yen Liang died on December 27, 2000 at the age of 92 in Fremont, CA. Our thanks to Yen Liang’s close friend, Shing-Yi Huang, for the use of excerpts from his memorial to Mr. Liang.